This frame shows the most change over older satellite images. As we had expected from previous developments, the ramp north of hangars 9-16 now has a more direct access to the new runway 12/30. The hangars 9-16 have a new roof, and a new hangar has been added east of the existing hangars. There is also a new building west of hangar 17. The most notable change, however, is the huge new hangar under construction in the southern part of the frame. We discovered this hangar from Tikaboo on June 10, 2007. It is obviously still under construction. With a size of approximately 185x345ft., this is now the largest hangar at Area 51. The height is between 75 ft. on the side and 95 ft. in the center. It appears to have two hangar doors, both approximately 132 ft. wide and 70 ft tall. 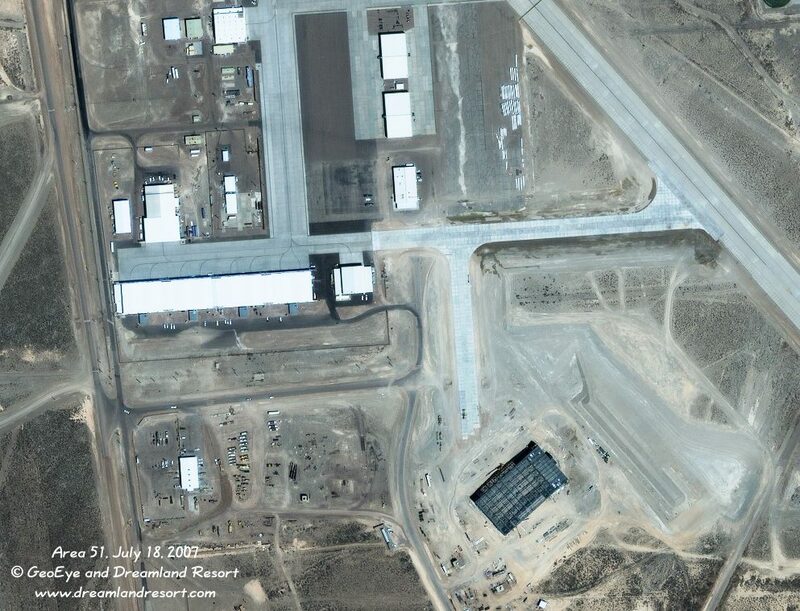 This is the only hangar, even the only significant building at Area 51, that is not aligned north-south. Instead, it appears to have the same orientation as the nearby runway 12/30, which can be seen in the top right hand corner of the frame. This, and the distance from the south ramp, could indicate that it is only part of a larger new complex. A new, 75 ft. wide taxiway connects the hangar to the South Ramp. The mound of dirt, which partially obstructs the view from Tikaboo, can clearly be seen east of the hangar. It has a footprint of about 125x628 ft. and is between 32 and 55 ft. tall. It looks too regular to be only temporary storage of excavated dirt. Instead, it seems to have been placed there to shield the hangar from view of curious Tikaboo hikers. In the current configuration the berm would also provide excellent sound shielding for whatever goes on aound the new hangar towards Tikaboo Valley, the closest area of public land.